What must you include in your personal statement? A personal statement is like a short reflective essay you write about why you’re the perfect candidate for the undergraduate degree course/s you’re applying to. It’s a key part of your Ucas application – alongside your predicted or achieved A-level, Scottish Higher, BTEC etc. grades – and is read by admissions tutors at the universities you apply to, who’ll decide whether to offer you a place or not. It’s important to note that you only write one personal statement, which is seen by all the universities you apply to. Also, a university personal statement works differently to a personal statement you'd write when applying to a job – so don't confuse the two. You have a maximum of 4,000 characters and 47 lines to write your personal statement. It’s best to draft your statement and get it finalised in a Word document, and then copy this over to Ucas’ system to submit it, rather than make changes afterwards. Going over the limit? Cut these from your statement. Your personal statement should show have you’ve made an effort to engage with your subject already, what you’ve learned, and how this relates back to the course (and possibly other future plans). This is known as the ‘ABC rule’: Action, Benefit and Course. See our guide to personal examples for more insight into what a personal statement should look like. Keep the above in mind as you plot out, draft and re-draft your statement so the things that do this best always take priority. Introduction: why you want to study this course at university. Remember, your personal statement is seen by all your Ucas choices; so don’t make references to a specific institution. Read our full guide for tips on how to begin your personal statement with a bang. Section one: academics – specifically subjects that are relevant to the course/subject you’re applying to. If you’ve taken an EPQ, this is the place to talk about it. This section should make up the majority of your personal statement – around 75% according to some careers experts – but this might vary depending on where/what you’re applying to. For example, Oxbridge are more interested in your academic interests than extracurricular activities. Meanwhile, a law or medicine applicant may want to invest more time talking about relevant experience they've accumulated, to stand out from those applying with similarly high grades. Section two: interest in and engagement with your subject beyond the classroom (thus demonstrating your deep interest). This could be through books you’ve read, events you’ve been to etc. Section three: relevant work experience (paid or unpaid) that has developed either your understanding of the subject, or the skills that applicants should have. To get an idea of what these are, read the course description for all the courses you’re applying to – search for a course on Which? University to find this in one place - and see what's common across all. Section four: hobbies and interests – this section should be brief, sticking to the most relevant ones only. It can help you stand out from other candidates (just be careful to stand out in the right way – read our full guide to hobbies and your personal statement for tips to do this properly). Section five: conclusion – this should reiterate the key points you’ve made already. If you have an idea of future aspirations post-study (eg postgraduate study, career), say how studying this course will help you reach these. Get more tips when writing your personal statement further below. While many students may apply to the same university course with the same grades as you, they aren’t you as a person, with your skills, experiences and thoughts. You need to stand out as a real person to an admissions tutor, as opposed to one of the many applicant numbers that will pass before their eyes. Your personal statement is where you can distinguish yourself from these other candidates. It’s where you can fill in the picture a tutor has of you in their head, and where you can leave a real impression that makes them want to meet you, or offer you a place. If you're invited to attend an interview, your personal statement is an opportunity to shape what you will be asked about – very useful if the thought of an interview terrifies you! At the very least, something in your statement could serve as a friendly icebreaker to ease you in. If you fall slightly short of the grades you need on results day, it’s a distinct possibility that your personal statement could clinch your place for you. Universities will often prefer to give it to you if your statement shows the kind of commitment and enthusiasm they’re looking for, rather than offer it to someone else who didn’t apply to them first time around. If you do find yourself in Clearing after results day, the universities you call will be able to see your personal statement. Therefore, your statement can help you make a big impression quickly during this fast-paced, short-notice interview process. In fact, we recommend re-reading your personal statement in the lead-up to results day to remind yourself why you would make a strong candidate – this could be a real confidence boost if you don’t get the grades you need. You’ll likely go through a few drafts before you get the polished final version that you submit as part of your Ucas application. So don’t expect to thrash it out in a weekend. While the Ucas application deadline for most courses is 15 January, your school may have an internal deadline before then, which you need to get your statement in by. Check when this is and work backwards from there, giving yourself enough time to get any personal statement help from teachers or careers advisers – they become pretty busy around that time of the year! It’s pretty much impossible to start your personal statement without a degree subject in mind (e.g. English or biology). It would be like applying to an unknown job by simply stating your general strengths or interests as a person – these won’t all necessarily correlate to those demanded by the subject. While you could pull together a rough draft while you’re researching, it’s much easier to write your statement with a good idea of your five Ucas choices. Again, remember that your one personal statement goes to all the universities you apply to, so making specific references might not be the best idea. You can search for courses for the subject you’re interested and to learn about the modules offered, to get a sense of what a course would involve. Can you write a personal statement for multiple courses? This doesn’t mean pouring your heart out or emotionally blackmailing an admissions tutor. But it does mean your personal statement should reflect why you’re the right candidate for the courses you’re applying to, based on your experiences, skills and understanding; after all, these makes you unique. Plus, any personal statements that show signs of plagiarism (i.e. copying from another statement) will be flagged by Ucas’ system. The universities you’ve applied to will be notified too. Obviously that won’t impress them and it may affect your chances of being accepted. Things vary a little when it comes to writing a personal statement for Oxford or Cambridge, compared to other universities (and not just when you need to get your application in by). Oxbridge personal statements tend to be more academic-centric and are a platform for you to discuss your understanding and thoughts on material that you’ve been exposed to, within your subject - theories, works, topics, issues. Provide evidence to show that not only do you meet the selection criteria, but also that you’ve researched the course (or profession) and understand what studying the subject at university-level will involve. Also, show that you're prepared for this by giving examples, such as having worked as part of a diverse group. Got a course in mind? Search and learn more about it. Which hobbies should go in your personal statement? Briefly explaining how one of your A-level subjects, a BTEC assignment, placement, or additional studies such as the Extended Project Qualification (EPQ) has made you think more critically could be a way of doing this. 9. What’s the long-term plan? Mention what your longer term goals are if you can do it in an interesting way and you’ve got a specific path in mind. If you do, then try to show a spark of individuality or imagination. If you’re applying for deferred entry, do mention your gap year plans if you’ve made a firm decision to take a year out. Most courses are happy for you to take a gap year – but they will want to know, briefly, how you plan to spend it. It can be difficult to get started with your personal statement, but don’t panic. Start with your strengths, focus on your enthusiasm for the course and talk positively about yourself. 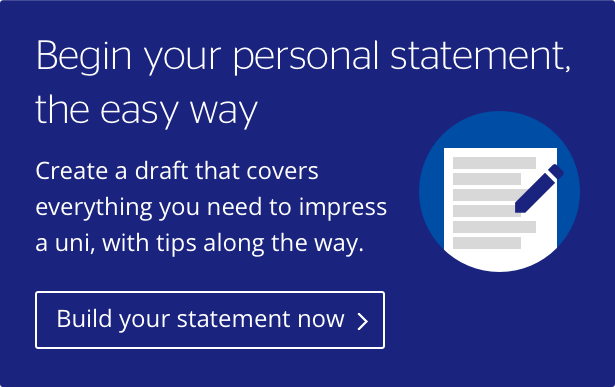 Try our personal statement builder to get your ideas down on paper, and take it from there. Read about more personal statement must-haves to help your chances of impressing an admissions tutor. Alternatively, you might want to consider what shouldn’t go into your personal statement. Need more personal statement help? And if you’re still stuck for what to write or how to get a broad structure together, our personal statement builder tool help get the ideas flowing.